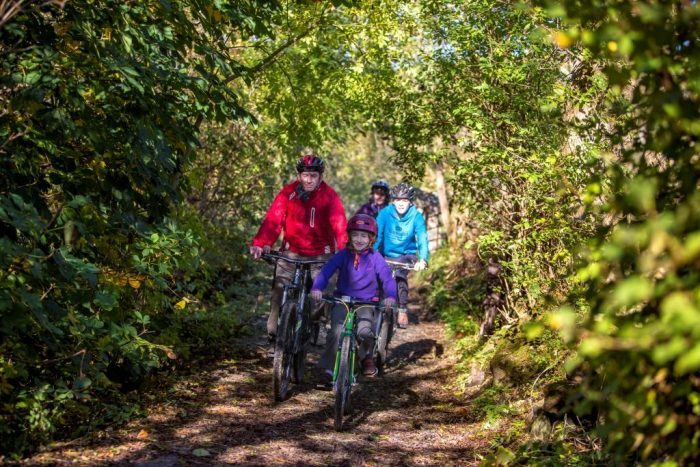 The Swale Trail is aimed at aspiring young mountain bikers and families who want to ride together. It is a unique facility in the Yorkshire Dales National Park – a valley bottom route 20km (12 miles) in length, of which 70% is on unsurfaced tracks. The Trail runs between Reeth and Keld in Swaledale and is easy to follow. You can do different sections or the whole route and there is bike hire, cafes and places to stop along the way. 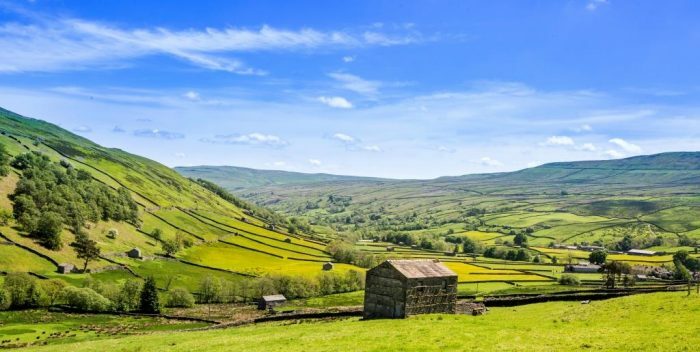 For many people Swaledale is the most beautiful valley in the Dales and the Swale Trail is a great way to experience it. Around 70% of the route is on unsurfaced tracks following existing routes that the National Park has upgraded, cleared and levelled to improve the riding surface along with installing Swale Trail signposting. The rest of the route follows quiet back roads. 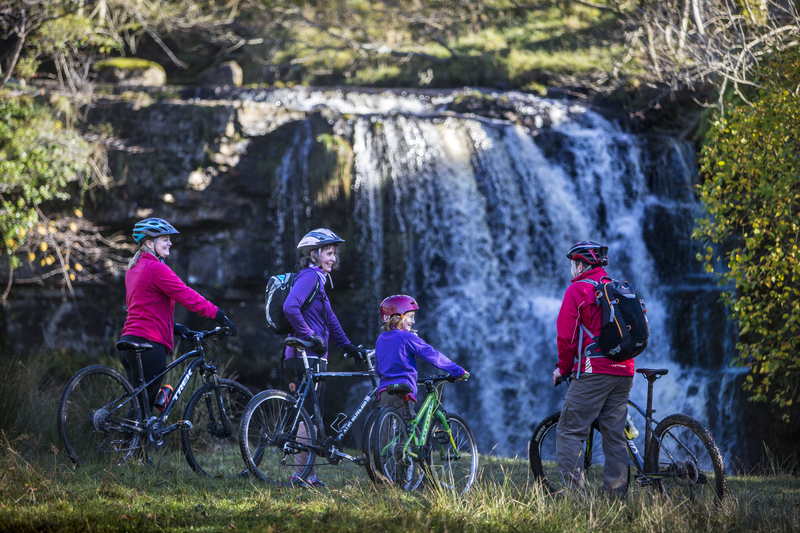 As cyclists saunter along the trail which snakes its way beside the River Swale, they can enjoy spectacular views across the unspoilt landscape and glean snapshots of Swaledale’s history. For instance the first section of the trail from Reeth is known as the Corpse Way, a route once used by families to carry their loved ones along the valley to Grinton Church and where there are still large stone slabs that acted as resting places for the coffins. The four-mile middle section from Low Whita, which is flatter and will suit families with younger children who want to pedal along just part of the trail, goes through native woodland and past clumps of wild juniper, before it reaches the village of Gunnerside. Here’s a good place for a midway pit stop at the pub or tearoom before tackling the hillier, wilder section of the route towards Keld. On this section cyclists will pass long abandoned settlements harking back to the once-thriving lead mining industry; meadows that are brimming with colour in late spring and early summer when the wild flowers are in full bloom; and spectacular waterfalls. You need to be a bit fitter and more experienced on this section – there is a short steep section over the river near Keld that you may want to walk over. The picture-perfect villages of Reeth and Keld also provide a good choice of cafes, tearooms and pubs as well as an ice cream parlour. Bike hire can be arranged through the Dales Bike Centre at Fremington near Reeth, or from Stage1 Cycles at nearby Hawes. You can pick up a leaflet and map of the route at Reeth National Park Centre (on the left-hand side of the market square) or at Dales Bike Centre. Alternatively, you can see an interactive map of the route and download a copy from the route page. One of the less known things about Swaledale is that it was once settled by the Vikings. Physically they have left little trace on the ground, but many of the place names in the valley have Viking origins. For instance, Keld, Gunnerside and Haverdale all have a meaning coming from these times. If you want to find out what those meanings were you will have to take on the Viking Challenge. We have devised this so you can discover more about this interesting bit of history. 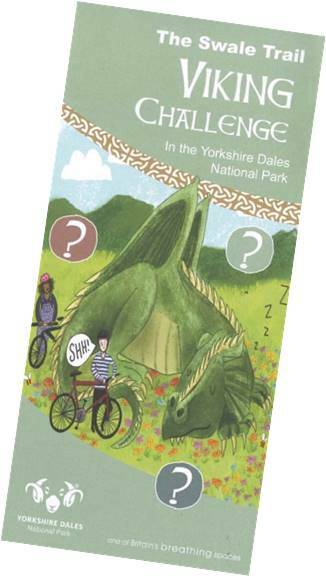 To take on the challenge you can pick up a leaflet locally or download it here.